This week’s featured board member is Nick Toney. 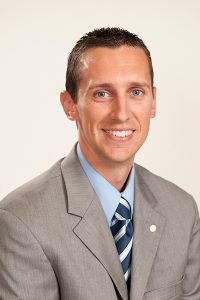 Nick is a VP and commercial banking officer for Lake City Bank and has been with the bank for 11 years. He is currently in his second year on the board of FWCC and was recently appointed Treasurer. He has served on the board of the Euell A. Wilson Center for 4 years and has volunteered with Junior Achievement for the last 10 years. For the past few years, he has also been volunteering and mentoring at Smith Academy for Excellence. He and his family are actively involved in church at County Line Church of God. Nick grew up in Warsaw and attended Grace College, where he graduated in 2005 with a degree in Business Education. He met his wife, Kiley, at Grace and they’ve been married for 12 years and have two wonderful children, Emerlynn (8) and Jarick (5). 1- How did you become engaged with FWCC? I was approached by Jonathan and Carrie, the current board chair, about helping to fill a vacant spot on the board. I definitely don’t have musical talent or a background in choir, so I was a little hesitant at first, but after talking with them and learning about the mission of the choir, I left extremely impressed and knew it was something I wanted to be a part of. 2- What were you most surprised to learn about FWCC after getting involved? Being new to any type of choir, just about everything was a surprise. I think what surprised me the most though was the level of music education provided to the children. I’m also really impressed with how much the choir does throughout the year and the amount of work put in by Jonathan and his staff to prepare for everything. 3- Why do you think FWCC is important to our community? I think the FWCC fills a large void being left by many public schools today in educating in the arts. I truly believe that this education is so important in the development of children and helps them to grow in creativity, gain self-esteem, become better leaders, and learn to interact with others and work together. 4- What is your favorite FWCC memory? My favorite memory thus far is attending my first Do-Re-Mi fundraiser last year. It was the first time I’d seen many of the choirs perform, and it was great to see so much support from the community through the money that was raised.